Welcome to the Elite Dangerous Newsletter #118. This week we're getting ready to meet up with the Distant Worlds Expedition at Beagle Point, preparing for the Bucky Ball Racers' ‘Total Recall’ event, looking at the latest GalNet news, introducing the Rock Rats, and much more. CMDR Frawd is the pilot of a Sidewinder landed at Beagle Point. This little Sidewinder (seen in the centre of the image) has been escorted by the Rock Rats over 67,000 LY away from Sol. The Rock Rats are dedicated to prospecting on the planet surfaces and finding routes for those with low jump ranges... like the little Sidewinder above. Good work Commanders! This video describes exactly how they did it, as CMDR Frawd had no SRV of his own to find the required materials in order to synthesize and make those last few perilous jumps to the outer edges of the galaxy. Zombiesuit posted this moody image whilst out exploring the deep vast darkness of space. He titled the image: 'Time to Explore the Dark Side'. Shwinky finds that 'Size is Relative' when he lands his Anaconda on a planet surface that is close to a nearby star. The next Buckyball Race has been announced, and this time it has an interesting twist. As the name suggests it involves recalling your ship at key points. Read the original forum post for the full details. "No secrets, no safety ratings ... this, ladies and gentlemen, is a race. One that I hope will test your skill in both the piloting of your chosen ship, and in the handling of your SRV. This race starts from Schneider Relay in the Epsilon Indi system. From there you'll be required to visit the following planetary landing bases, in whatever order seems best to you, and to drive at least 5km across the surface of each of their planets, before finally returning back to the start." Head over to the forum thread to find out how to get involved. It started on the 14th January, and now, 23 key stops along the way and more than 55,000 Light Years travelled, the Distant Worlds Expedition is about to reach its final destination - Beagle Point. Ed will be joining the fleet on their final approach, celebrating the amazing feat these 1000+ Commanders have achieved. Make sure you join us on our official YouTube channel at 19:00 GMT on Thursday April 7th. 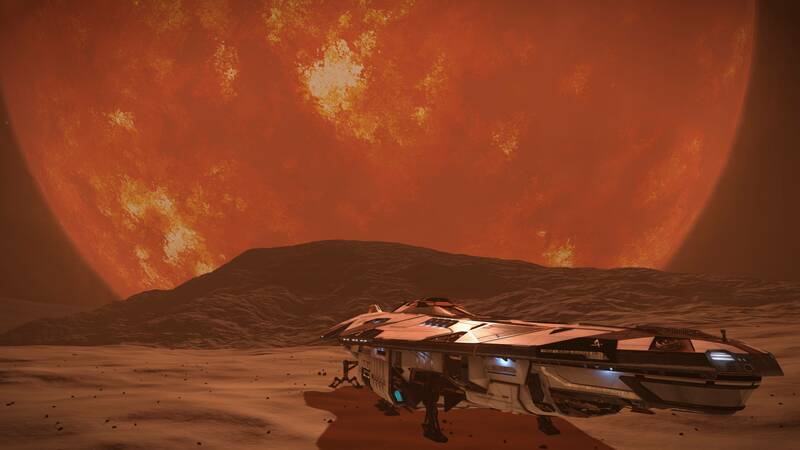 The Elite Dangerous subreddit and the Elite Xbox One subreddit continue their joint AMA series this week with a few new guests coming along for you to ask them anything. This week's Ask-Me-Anything sessions are all taking place on Saturday 2nd April. • Fuel Rats - They don't take themselves seriously... they take rescuing you seriously. Over 7,000 CMDRs saved... service above and beyond expectations. They have fuel, you don't... any questions? • EXO - Free from the shackles of the old powers, CMDRs may keep their allegiances but must respect the neutrality of EXO territory. An attack on one of them is an attack on all EXO. Rise up now, never surrender! • Author of official novel Elite: Mostly Harmless, Ambassador for the Gamer's Charity SpecialEffect, reporter for the BBC's technology programme Click, winner of the 2015 UK Blog Awards for Best Individual Digital and Technology Blog, and a partnered Twitch streamer. Azalea Halsey, the sister of former Federal president Jasmina Halsey, visited her sibling at Leoniceno Orbital this week. According to Azalea, the former president is in good health, although she is understood to have made cryptic comments about “stars and creation”. Edward Bores, the Federation’s new ‘Onionhead tzar’, has launched a campaign called ‘Hand in the Head’ designed to encourage Federal citizens to surrender any Onionhead in their possession. Meanwhile, an organisation known as the Altair Purple Mob has launched a competing campaign to prove that the drug is harmless. Both parties have called on the galactic community to bring them quantities of the controversial narcotic. The Pioneers Cooperative has announced that the recent appeal for meta-alloys has received the full support of the galactic community. Having taken delivery of thousands of tonnes of meta-alloys, the organisation will now begin producing ship modules that can safely transport the Unknown Artefacts. The treasure hunt organised by eccentric billionaire Alfred Jeffress has come to an end, with a pilot by the name of Commander Oriza claiming victory. The victor will receive a share of Jeffress’s vast personal fortune. The Revolutionary Party of Vennik announced that it has received sufficient quantities of terrain-enrichment systems to bring its terraforming project to a successful conclusion. The success of the campaign will allow the organisation to embark on the final phase of its plan to terraform Vennik 1, by preparing the planet's surface for agricultural development. The Danger Zone is back with some more CQC Arena action against the developers! Come along for the chance to take on the Elite Dangerous Programmer Dominic Corner, and returning hot shot pilot (sort of), and Elite Dangerous producer, Adam Woods, and also the chance to win prizes! Make sure you join us on our official YouTube channel at 19:00 BST on Tuesday 5th of April. Grandin Gateway, Altair – Deliver pure Onionhead to Grandin Gateway in the Altair system to support the Federal 'Hand in the Head' appeal to dispose of the narcotic. Tereshkova Dock, Altair – Deliver pure Onionhead to Tereshkova Dock in the Altair system to support the project to legalise the narcotic. No matter which side of the Onionhead debate you’re on, fly safe out there, Commanders! ObsidianAnt shows off a new voice pack... with William Shatner’s voice! A smooth voice to listen to while playing Elite Dangerous. “Good news everyone!” says Futurama’s Professor Farnsworth. 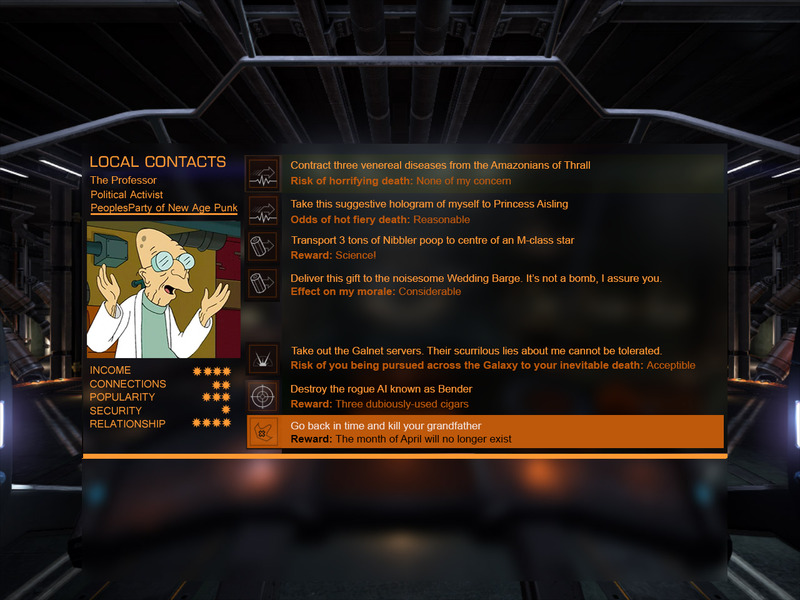 CMDR Zorrito shared this Futurama parody of a mission image. Scott Manley on YouTube decided to have a go at flying his ship with inverted controls. That’s it for Newsletter #118. Please don't reply to this email; this address is not monitored. Instead you can get in touch with us at community@frontier.co.uk with any questions about the newsletter. Please use our support page: http://support.frontier.co.uk if you have any support-related queries.